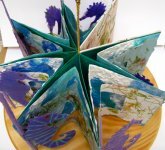 This book is a double star book based on a carousel theme. 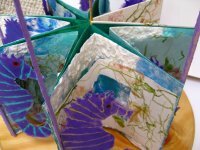 Each star section is made with seaweed imbedded and textured papers. 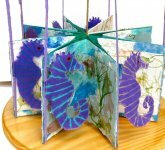 The individual seahorses are hand pulled, pulp painted, coated with bee's wax, and sewn onto pulp dipped wooden dowels.